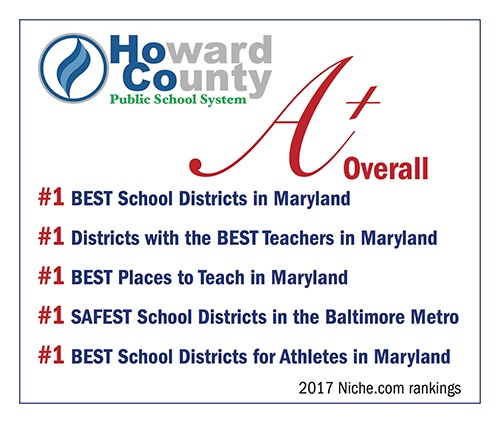 For the second year in a row, the Howard County Public School System (HCPSS) has been named the top school system in Maryland by Niche.com, a national education and community analysis firm. The 2017 Best School Districts in Maryland rankings give HCPSS an overall grade of A+ and rank Howard County public schools #1 for “Best School Districts in Maryland,” #1 for “Districts with the Best Teachers,” #1 for “Best Places to Teach in Maryland,” #1 for “Safest School District in the Baltimore Metro,” and #1 in “Best School Districts for Athletes in Maryland” among Maryland’s 24 public school systems. See where our schools stand by viewing and sharing the Baltimore Metro, Maryland and National rankings.